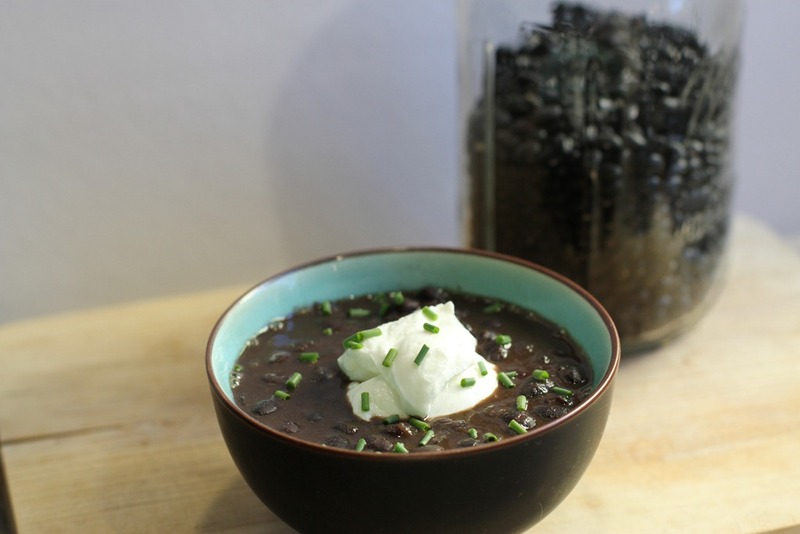 I like lentils as much as the next girl, but when the non-vegetarian soups range from wild mushroom bisque to black bean soup, I have some serious soup envy. Especially since many of those soups could be easily made vegetarian by using vegetable broth instead of chicken broth. So I decided to make a simple, vegetarian black bean soup this weekend. You need the better part of an afternoon to make this because you start with dried beans, no soaking required. The beans cook as the soup simmers. I added some taco seasoning for extra spice and nutritional yeast for extra protein, but you could leave those both out and still have a basic but hearty soup. This soup is cozy and comforting and super filling. It’s not missing a single bit of flavor for having vegetable broth instead of chicken broth either. Makes four servings. Chop the onion, dice the garlic, and deseed and dice the jalapeno. You can leave in some of the seeds if you prefer the extra spice. Add the olive oil to the bottom of a large Dutch oven over medium heat. Add the onion, garlic and jalapeno to the Dutch oven and cook until the onion is translucent. Add the dried black beans and the vegetable broth to the pot. Cook at a simmer for several hours, stirring and tasting periodically. Adjust the salt and pepper when you taste. When the beans are soft, stir in the nutritional yeast and taco seasoning. Simmer for another 15-20 minutes before serving. You’re trying to strike a careful balance between having the beans be soft enough and still having enough broth so it’s a soup and not just a tasty pot of beans. I garnish my soup with some Greek yogurt and chives, but there are many options here. Tortilla chips, cheddar cheese, goat cheese, scallions, sour cream, lime juice, they’d all make great additions to the soup. This entry was posted in Food, Recipe, Uncategorized and tagged Comfort food, food, recipe, Soup, vegetarian. Bookmark the permalink. Nice photo; I stopped by after seeing this on foodgawker. I used to eat a similar soup in my university’s dining commons. It was one of the few tasty things there that I grew to like. I would love to try and recreate it on my own! Beautiful photograph……and fun to get a sense of you and the “context of cooking” — always the best part of reading about food. 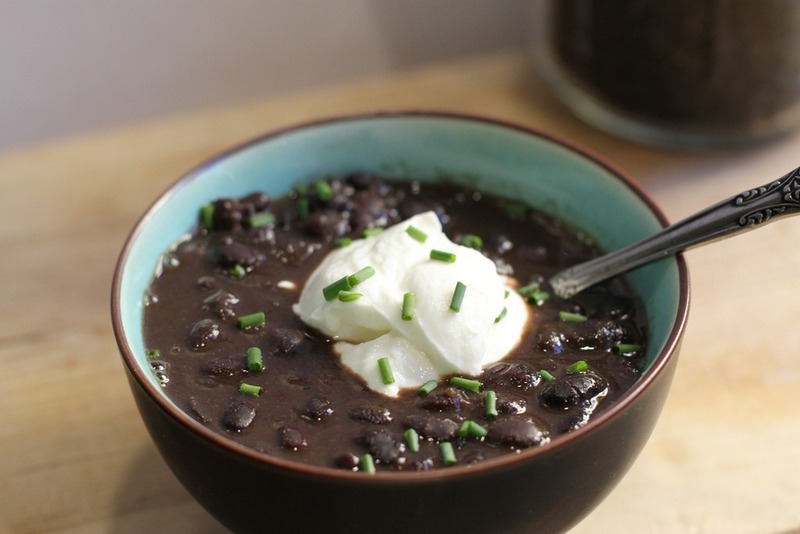 Very creative alternatives (not just the usual one or two) for what to add to the black bean soup…..! Thank you, Beth! You can email me at Boston2Berkeley@gmail.com I'd love to hear from you!